This Frequency Counter is suitable to display the frequency of a frequency generator with an analog setting. It is a very simple counter and can be used as a module in a box with a frequency generator. It does what it says, it measures frequencies up to 2 MHz and shows the frequency on a 6 digit 7 segment display. 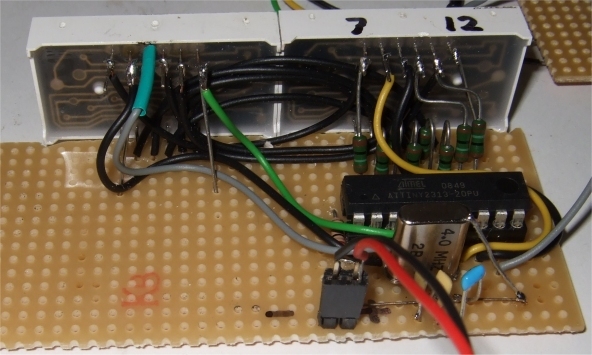 The resolution is 10 Hz, we have only 6 digits because I once got a bag full of 3 digit common anode displays and here we already use all available pins on an Atmel ATTiny2313. Here you see it in a box with two frequency generators and it shows the frequency in kHz. 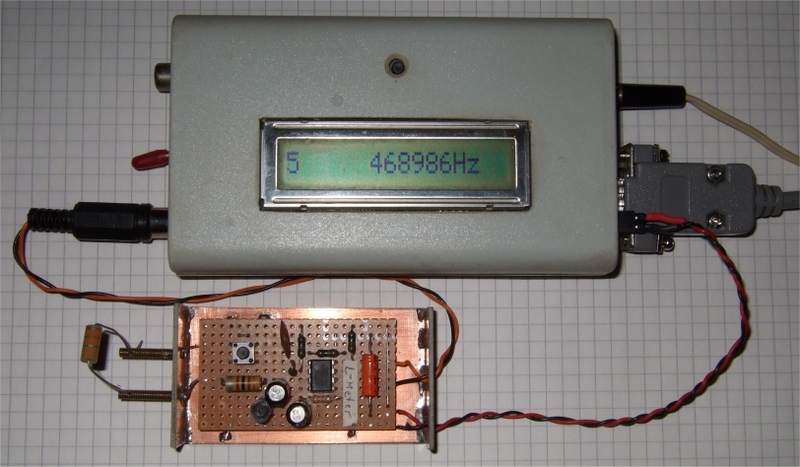 In the box, on the left is a 15Hz to 30 kHz dds sine wave generator and on the right is one with the famous XR2206, the switch below the display switches between the right and left side frequency display. Here it shows the maximum frequency of the XR2206. Components needed for this small project are one Atmel ATTiny2313, eight 220 Ohm resistors, two 3 digit common anode displays and one 4 MHz quartz, which I just had in the box. It's possible to use e.g. a 8 MHz quartz which would extend the frequency to 4 MHz but then the the gate routines need adjustment, easy to do. It is programmed in assembly language and compiled with gavrasm. Timer/Counter1 is used as the frequency counter and Timer/Counter0 for the gate time. At Timer/Counter1 count input T1 PD5 (Pin 9) the frequency is measured. A square wave should be present at this input so it could be wired to a Schmitt trigger front end as e.g. a 74HC132 to shape sinewaves. With a prescaler of 64 and a compare value of 125 a Timer/Counter0 Compare Match A interrupt fires every 2 ms. This interrupt is used for for gate timing and to update the display. One software counter counts to 50, then stops Timer/Counter1 and displays the result. The gate time is 50 * 2 ms = 100 ms with a 4 MHz quartz. During this interrupt the display is updated. Leading zeros are blanked for easier reading and the decimal point is fixed in software. The 7 seg digits are connected to PORTD, the segments to PORTB of the 2313. Below are the details of one of the 3 digit common anode 7 seg display which I had available. You need to adjust if you have a different display type. A standard perf board holds all components, the displays and some resistors are wired vertically to give a small footprint of the assembly on the frontpanel. All 7 seg pins are wired to the nearest port pin of the 2313, that is the easiest way. It results in B G C dp D E F A for the segments and we need a translation table to display the segments correctly. This is done in software, software follows hardware as it should do. See translation table below. This frequency counter has only one option: measure frequency. As you can see all pins are used. Anyway I use it in my little frequency generator box and it works well. 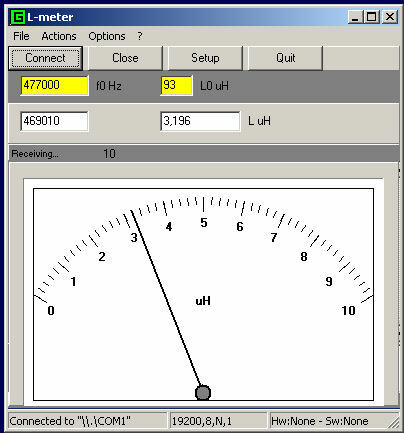 Hier ist noch eine Idee zum L-Meter mit LM311. Das hat fast jeder mal gebaut. Ich habe das zusammen mit einem Frequenzzähler verwendet und die Daten in ein spreadsheat eingetragen und die Induktivität berechnet. Das geht gut wenn man gelegentlich damit arbeitet. Der Frequenzzähler hat eine serielle Schnittstelle, und so habe ich dann ein PC Programm geschrieben, das die Frequenz auswertet und dann L anzeigt, digital und analog. Es ist recht einfach und rechnet mit double precision, aber es ist nur eine Idee für eigene Versuche. .def	byte0		= r18		;Byte0..Byte4 for binary to bcd conversion. mov	byte2,cntL		; Move the upper 16 bits of count into the appropriate registers. rcall	Conv32bit2bcd		; Convert binary data in byte0..byte 3 into byte0..byte4. ldi	temp,0b00000111 	; External clock on T1 pin. Clock on rising edge. inc	cntL			; Increment cnt register upon overflow of 16 bit counter1. ldi	temp,0b00000111 	; External clock source on T1 pin. Clock on rising edge. ;Listed above as lsB first, msB last. push	r23		;input or output. pop	r24		;Restore saved registers. ;* r18:r19:r20:r21  >>>  r20:r21:r22:r23:r24  <== this one.